More bioavailable than leading brands of HCA (potassium-calcium salt). 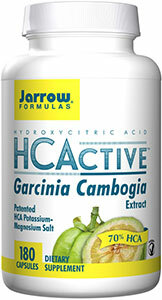 Jarrow Formulas® HCActive™ is a 70% concentrate of hydroxycitric acid (HCA) stabilized as a potassium-magnesium salt extracted from the fruit of Garcinia cambogia. HCActive™ was tested at Georgetown University and found to be highly absorbed and more bioavailable than a leading HCA potassium-calcium salt. HCActive™ supports appetite control and weight management. HCActive™ is protected by 9 U.S. patents. Take 2 capsules twice per day 30 to 60 minutes before breakfast or lunch and again 30 to 60 minutes before supper, or as directed by your qualified healthcare professional.